Green Party leader Natalie Bennett has hinted her party could work with UKIP to secure meaningful electoral reform after Britain’s first past the post (FPTP) voting system delivered results unrepresentative of the parties’ genuine support. Bennett, who lost out on a seat in last Thursday’s general election, told reporters she would be “happy” to work with UKIP after both parties won only one seat each, despite having proportionally much higher levels of support. 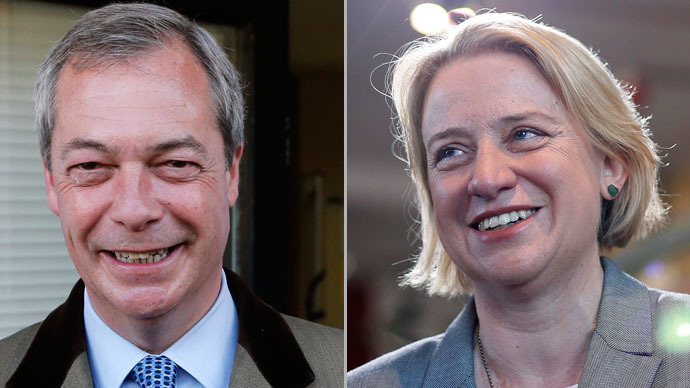 The Greens received 1.1 million votes and UKIP nearly four million, but only won one seat each. The results have triggered a call for the FPTP system, which handed the Scottish National Party (SNP) an impressive 56 seats despite only gaining 1.4 million votes, to be reformed in favor of a more representative voting system. Bennett came third in her constituency of Holborn and St Pancras, but has ruled out stepping down as leader, saying that being able to lead the party without the confines of a Westminster role was liberating. “Obviously I would love the chance to be in Parliament but the reality is that it works very well with Caroline Lucas (the Green Party's only MP) in there fighting almost like the equivalent of the 25 MPs we should have under proportional representation. “While I’m not an MP what I’m free to do is travel round the country and be very much not Westminster-focused. She added that she believed the appointment of Amber Rudd to the position of Energy Secretary was an improvement. “One always has to look back to the last Parliament and think ‘At least she isn’t [former energy secretary] Owen Paterson, who it emerged after he was sacked was a climate change denier. Prior to the general election, UKIP’s now sole MP, Douglas Carswell, said the party would consider advocating electoral reform.